Employees of the Institute of Urgent Medicine appreciate the progress made in the health system. Within a meeting with PDM President Vlad Plahotniuc, doctors and nurses valued that their wages increased and working conditions were improved during the democratic governance, moreover, they wished the good projects will be continued. In the last three years, salaries of employees from the Institute of Emergency Medicine increased by 81 percent for nurses and doubled for resident doctors. The newest raise, approved last year, increased 20% wages of medics. The measures were enabled thanks to the order and discipline made in the country by the Democratic Party. "In 2016, we found an ill Moldova, already chronically sick. We applied injections but the patient we took at that time, Moldova had no prospects anymore. 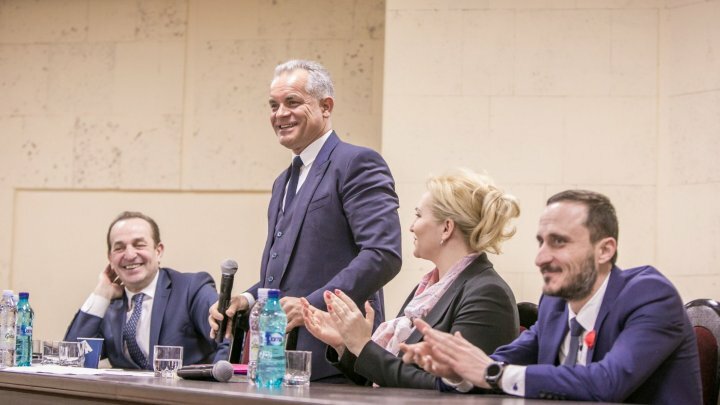 We applied shock therapies when we intervened in structures to form budget and we began to make order", said Vlad Plahotniuc, PDM candidate. "I have been working in the Institute for Emergency Medicine for almost three years. Our salaries were raised during this period", said Vasile Şovgur, Head of the Emergency Medicine Department. In addition to salaries, measures were also taken regarding patients' attitudes towards doctors and vice versa. Improvement these relations remains a priority for PDM candidate in constituency no.26, neonatologist Mihai Stratulat. "There are three important things to me: Doctors must have good working conditions, good salaries, patients must trust the medical system and the medical system must be cleansed. The patient should enjoy a friendly environment, but at the same time, he must be responsible for abusing the doctors", said Mihai Stratulat, PDM candidate on the constituency 26. Physicians also noted the investments made in the health care system, including the Emergency Hospital. Over the past four years, medical equipment has been purchased and investments in medical technology amounting to about 300 million lei have been made. The doctors asked the Democratic leader questions and requests and were convinced that the government would honor its promises, as it has done so far. "Analyzing, I want to say that you have a very good team and the results speak for themselves, so as an appeal to my colleagues will be to support the Democratic Party in the proper elections," said Stanislav Groppa, academician. Each year, up to 81,000 patients arrive at the Emergency Hospital, of which 24,000 are hospitalized.